Just 3 miles outside of Blowing Rock, you'll find a cozy 2 bedroom / 1 bath log cabin with a beautiful view of the valley. Relax on the porch and watch the birds while you soak up the solitude on this 5 acre tract of wooded forest, or take a hike on the trails and investigate the mountains and nearby streams. 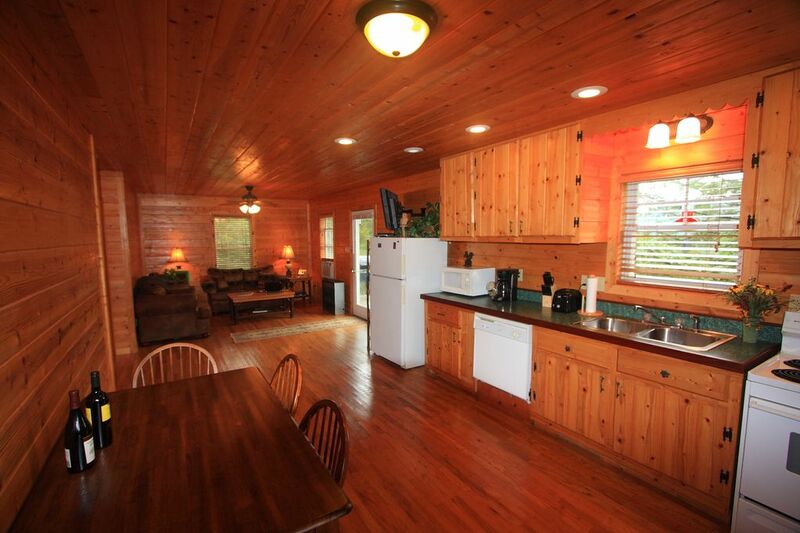 You will be sure to enjoy the log cabin feel, while enjoying the relaxing atmosphere. You'll be pleasantly surprised at the abundance of activities throughout the year. Located just minutes away, you will find Blowing Rock, which offers some of the finest dining, unique shops, and beautiful parks with tennis, playgrounds, and riding stables. Located outside of Blowing Rock on your way to Boone, is the scenic Blue Ridge Parkway. With its many overlooks, picnic areas, and hiking trails, it is a popular way to spend your day. Boone enjoys many year round cultural events sponsored by Appalachian State University. Take State Road 105 to Linville, where you'll find Grandfather Mtn. Family Reunions & Friends Wanting to Stay Close By: This property is located on approximately 5 acres. It adjoins our other properties #112607 and #3800220. Great for friends and family who want to be close, as these properties are only about 1/8 of a mile away from each other and are within walking distance, but desire separate living quarters. They are the only cabins on this road. Bathroom has a stackable washer and dryer. A lovely view from the deck of the valley. Cabin telephone number provided upon request. Window units in den and master bedroom. Floor fan and ceiling fans. Password is on the bulletin board just to the right as you enter the cabin. Inside table seats 4 comfortably. Outside table seats 5 comfortably. Beautiful house with wonderful view! Thank you for your kind words! We love staying at Mountainside in the fall! Glad you enjoyed your stay! Very cozy. Felt like a home away from home. Great view. The views were great! The overall cleanliness was questionable. There was dog hair all over the sheets. A few little things might make a big difference. (ie. coffee filter for the coffee maker, no chairs for the fire pit, etc.) Also, the road getting there and getting out is very steep and rather rugged. Don't bring a civic! Beautiful location; could use some work. The location is really the star of this place. Close to Blowing Rock, but private with a great deck and firepit overlooking the scenery. Decent size common area/kitchen. However, I would not stay again due to the mouse and stinkbug problems. There were a lot of mouse droppings behind the beds and in the lower kitchen cabinets. Mice were still active, too, with one leaving a deposit on one of the beds after it was made. A ton of stinkbugs, living and dead. I could have lived with the stinkbugs, but not both. We also appreciate being so close to Blowing Rock while being very secluded in the woods. It is quiet and being in the woods means that we are very close to nature. When a cabin stays vacant too long, deer, fox, chipmunks, mice, etc. feel very comfortable in venturing right up to the cabin. After a cold winter, it is not unusual for a mouse to find its way into the warmer temps of a vacant cabin. We also have a short window where the Christmas tree industry will drop beetles to help keep their trees healthy. That is why we have our cleaning service perform a spring cleaning every year and a pest control check; however, this year we were unable to schedule it until the end of April. We have since had our pest control service out to check and treat as necessary. We have also had a spring cleaning performed. We always appreciate it when someone lets us know if something needs to be fixed or changed so that we can continue to provide our guests with a relaxing vacation. We hope that you would reconsider staying with us again at a discounted rate with our apologies for nature finding its way into the cabin instead of staying outside! Owners very helpful and responsive.